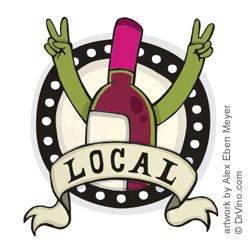 Wino trend #1: Love of local wines (Be a Locapour). No matter where you are, whether you are on home turf or traveling, choosing a locally made wine is “in”. Not only are local wines eco-friendly, they can add to your experience. Opt for local. As you may have noticed we try and keep things pretty positive on SIP. We have so much good stuff to report and our wine scene is really happening. So let's consider this a gentle nudge, a friendly suggestion, or maybe a wake-up call to some fine places about what's missing from their wine list. Local wines. Restaurants make such a fuss about buying local. In Spokane, saying ‘buy local’ is like touching gold. This does not always extend to wine. We have many restaurants doing a great job supporting our local wine industry. On SIP, we try to recognize them every chance we get. But we still have some well known restaurants that when you look at the wine list and you might see one or maybe two local wines. If we didn't have such great local wine, I would completly understand a dining establishment passing on the local wineries. But that's not the case. What can we do about it? That's easy. Request local wine. Love the patio on the Centennial Trail along the Spokane River. But honestly, this has been an out of site, out of mind restaurant for me. Recently, I revisited the delightful patio and horror! they almost completely forgot about our local wineries on the wine list. *Request local. This wine list needs some localization. Note: RK Cellars informed us that CI Shenanigans is featuring Robert Karl this month. They will have a bottle on each table- glass pour $7, bottle for $30. We hope they continue this and add more local to their list. Another deck I adore. Overlooking the Spokane River this is a Spokane landmark restaurant located in the historic Flour Mill. So many things right. Uh-Oh they forgot to check out the local wine scene and add the home town hits to their wine list. Cool space. Retro recycled decor, tilt-a-whirl booths and live music almost every darn night. One problem; almost completely absent on the wine list are local wines. *Request local. This wine list needs to be localization.